Barrie’s widow Tish is pictured with the winning GS Group team (from left) George Stubbs, Richard Hally, Billy Sinclair and Tony Stewart. THE GS Group team led the way at the inaugural Barrie Douglas Foundation Golf Day held at Perth’s Craigie Hill Golf Club. 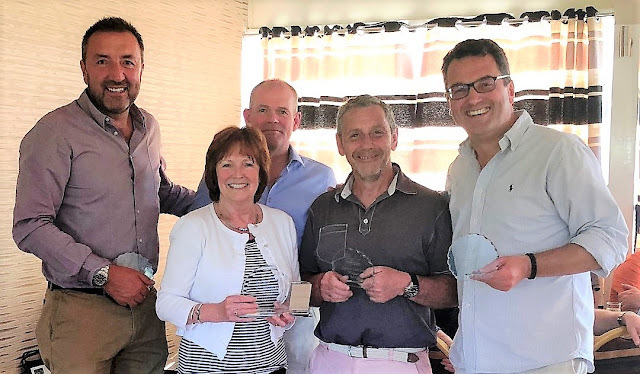 The event, held in memory of the well-known golfer, administrator and national boys’ team captain and R and A selector, was an immediate sell-out, reflecting the high regard Barrie was held in, both in sporting and business circles. The Perth-based GS Group was also the main sponsor for the Foundation fundraiser, which will support grassroots golf development in Scotland.